Yesterday, McGill’s Board of Governors approved two recommendations from the Nominating, Governance, and Ethics Committee. Member-at-large Ram Panda will be the next Board Chair, and Michael A. Meighen has agreed to a second term as McGill’s Chancellor. Both appointments begin July 1, 2017. During the closed session of its meeting on December 1, 2016, the McGill Board of Governors approved two recommendations from the Nominating, Governance, and Ethics Committee. 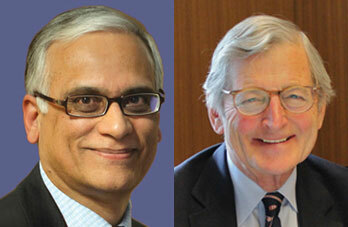 Board member-at-large Ram Panda will assume the duties of Chair, while the Honorable Michael A. Meighen will begin a second term as McGill’s Chancellor. Ram Panda (MEng’71, MBA’77) came to Canada – specifically, McGill – from his native India in 1968. After graduation, he stayed in Montreal, co-founding Invera Inc., which is now one of the leading software providers for the metal industry. In recognition of “the hospitality I experienced and the level of acceptance I encountered [that] helped me to settle down quickly and integrate easily into Canadian life,” Panda is dedicated to giving back to the community. He is one of the philanthropic drivers of the Institute for Sustainability in Engineering and Design and has been a member of the Faculty Advisory Board for Engineering since 2007. “Ram is passionate about sustainability and McGill’s role in the community,” noted Cobbett in his message. Panda has been a member-at-large of the Board of Governors since 2014, a position to which he has been reappointed for a five-year term. Cobbett was first appointed to the position of Chair on January 1, 2010. His current term ends on June 30, 2017. Panda’s appointment as Chair is for five years; Meighen’s second term as Chancellor is for four. Both appointments are effective July 1, 2017.